A challenge to Rahm Emanuel and corporate Democrats sows the seeds of a new urban populism. 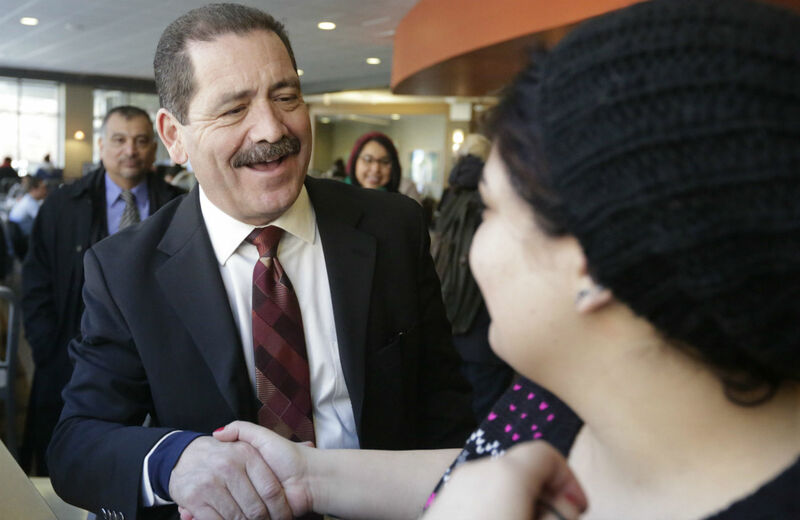 Chicago progressive Jesus “Chuy” Garcia made political history in February, when he forced Rahm “Mayor 1%” Emanuel into an unprecedented runoff election. For the first time since the nation’s third-largest city established a nonpartisan system for choosing local officials, a mayor fell short of 50 percent of the vote and had to face a challenger in a second election. “Emanuel’s overwhelming financial advantage ultimately helped save the mayor as he fought for his political life,” acknowledged The Chicago Tribune in its Wednesday morning assessment of the results. Garcia’s finish was better than even optimistic allies predicted when he entered the mayoral race last fall, as a county commissioner with a solid record of progressive activism but little name recognition—and less money. Garcia’s finish was also better than the one Harold Washington secured in his first run for mayor. That’s right: the hero of Chicago progressive history who beat the money and the machine in 1983 to become the city’s first African-American mayor did not simply appear on the scene to upset incumbent Mayor Jane Byrne and Richard Daley, the son of the city’s longtime mayor and legendary political boss. Six years earlier, when the senior Daley’s death forced a special election for the mayoralty. Washington mounted an insurgent primary campaign against the machine and the downtown money power. On paper, Washington’s 1977 run sounded like a great idea. With more than a dozen years of experience as a state legislator, with a network of supporters in the African-American community, and with three white candidates dividing the base of a political machine that looked to be in decline, Washington simply had to pull together a coalition of African-Americans, Latinos and liberal reformers. But it didn’t happen. He won just over 10 percent of the vote—a “dismal” finish, in the words of The New York Times. Washington learned from the experience. He built on the independent base he had begun to develop in 1977, got himself elected to Congress and developed a strategy for winning in 1983. His plan was to lead “anti-greed and anti-corruption” coalition rooted in a faith that would eventually define his mayoralty: “We are a multiethnic, multiracial, multi-language city and that is a source of stability and strength.” It was not easy. The opposition was crude and divisive. Even after Washington won his primary victory, many Democrats backed the Republican in what was then a partisan runoff. But Washington prevailed—by a 52-48 margin—because of the city-wide coalition he and his supporters had built over not weeks or months but years. That’s the lesson that ought to be taken away from the 2015 results. The coalition that backed Garcia and progressive council contenders this year is young and dynamic. It is still evolving. But it is real. Illinois Federation of Teachers President Dan Montgomery got it right Tuesday night when he said that forcing a runoff and opening up the process “made an undeniable impact in Chicago.” This city has been changed by this campaign. The city council will have a larger progressive caucus and Emanuel will face steady opposition—inside City Hall and on the streets—to his pay-to-play politics, privatization schemes and assaults on public education. The unions are not going away or backing down. Neither are the local activists associated with the National People’s Action Campaign (through its Reclaim Chicago affiliate), Progressive Democrats of America, Democracy for America, MoveOn.org, the Progressive Change Campaign Committee and the Working Families Party. The United Working Families organization provided an early endorsement for Garcia and progressive council candidates and worked with union activists in wards across the city to build grassroots networks that will continue to be a force in local politics. Garcia’s strong finish—along with victories by progressive council candidates—makes that change seem possible. The progressive movement of 2015 has a much bigger base upon which to build than did Harold Washington had after his first mayoral bid of 1977. Neither this year’s election results, nor the history that points to what might be, provides a guarantee of change. They merely raise the prospect. But in a town as slow to change as Chicago, that prospect is a big deal. Chicago did not elect a new mayor this year. But it has shaken things up for an old mayor. And it has held out hope for a new politics not just in one city but nationwide.